We are heartbroken to pass along the very sad news that Sheldon passed away while under anesthesia during his dental surgery. We loved this droopy,old guy a lot and are very sad to lose. Thank you to those of you who donated to help give this guy a second chance though the outcome may not be what we all wanted. At least Sheldon knew there were people who loved and cared for him. Hi. My name is Sheldon. 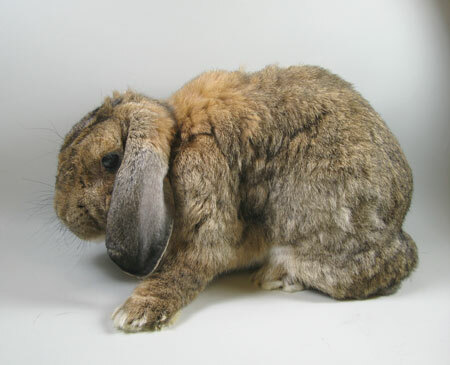 I am a big, neutered French lop mix guy. Yes, I'm a droopy-looking guy, yet, you have to admit it...I am really cute in my all my glorious droopiness. I've had a hard life, full of neglect , but now, I am doing really well here at SaveABunny. I cleaned up well and decided that I like being petted and having people talk to me. I enjoy playing with my toys and have a whole new positive outlook on life. There's one remaining issue with my health and I hope you will help me. I have what's called a malocclusion on my front teeth, which means my teeth do not meet up properly. This affects my ability to eat and groom myself. SaveABunny is taking me for dental surgery and your donations are urgently needed to help with my veterinary bills. Izzy, a compassionate 11 year old girl, raised $200 for me by asking for donations instead of presents for her birthday. Can you match her gift? That's her birthday wish for the bunnies! Your generous donation of any size is greatly appreciated, tax deductible and much needed. Thank you for caring about me. I am excited about my new life and fresh start with people who love and care about me!